IBM® Datacap helps you streamline the capture, recognition and classification of business documents and extract important information. Datacap supports multiple-channel capture by processing paper documents on scanners, mobile devices, multi-function peripherals and fax. It uses natural language processing, text analytics and machine learning technologies, like those in IBM Watson, to automatically identify, classify and extract content from unstructured or variable documents. 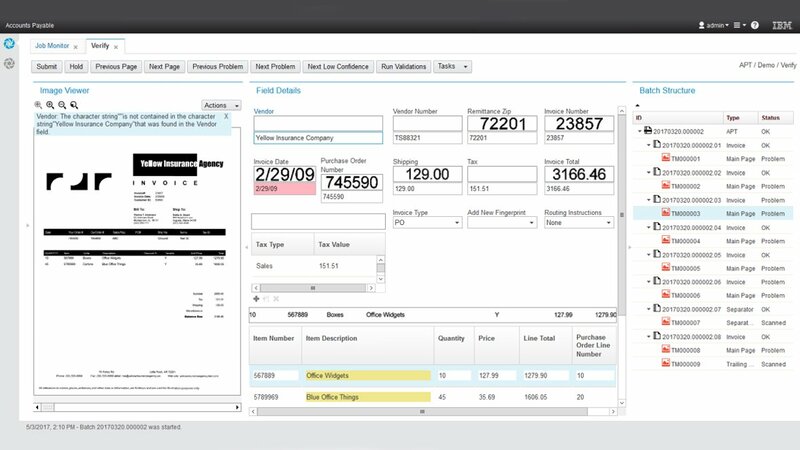 The software can reduce labor and paper costs, deliver meaningful information and support faster decision making. Supports scanners, fax and digital files (such as PDF) as well as images from applications and mobile devices. Uses machine learning to automate the processing of complex or unknown formats, as well as highly variable documents that are difficult to capture with traditional systems. Enables you to export documents and information to a range of applications and content repositories from IBM and other vendors. Offers configuration of capture workflows and applications using a simple point-and-click interface to speed deployment. Enables documents to be redacted automatically, based on the role of the requester, blocking out information according to a user's specifications. Automatically divides content ingestion workflow using role-based job filtering capabilities to improve productivity. Core product. Provides automated enterprise capture technology that combines advanced document management capabilities into a digital workflow. Enhances Datacap image capture through a streamlined, mobile user interface for Android or iOS devices. Enhances Datacap with cognitive capture technology to automate the processing of complex, highly unstructured documents. Provides Datacap offerings in a managed services cloud environment. Helps you capitalize on the agility and cost-effectiveness of image capture in the cloud.